The kind bartender, Alejandro pours me a glass of chilled white wine as I sit at Sono’s bar taking in the atmosphere of this sleek Japanese restaurant. The bar glistens in the dim red lighting as Alejandro proceeds to place a regular’s order. Sono has unique sushi rolls like the tuna ecstasy, French kiss, and skittles, and strives to offer the best tasting Japanese food and service in downtown Raleigh. 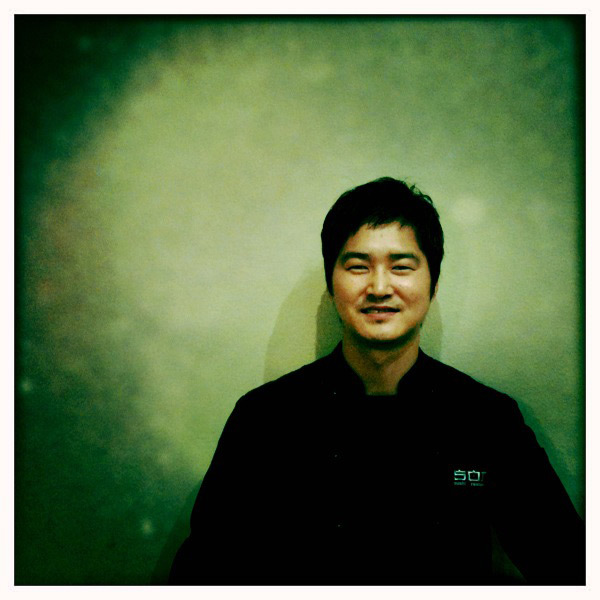 The humble and friendly Chef Mike Lee has been with Sono since the beginning in February 2008. He began working in the food industry in 1994 flipping burgers at a Sonic Drive-In. After working under two master chefs at a Japanese restaurant and sushi bar during college, Chef Mike decided to tell his parents that college just wasn’t working out. As you can imagine, Mike’s parents weren’t exactly thrilled after finding out he disenrolled each semester. At least now we can all be thankful Mike chased his dream of becoming a chef. Instead of sticking his nose in computer engineering textbooks, he studied under chefs in countless cities throughout the United States. Chef Mike makes it his priority to visit Japan to conduct research about the country’s latest food trends, where he eats at six restaurants a day and gains at least 15 pounds after each trip. 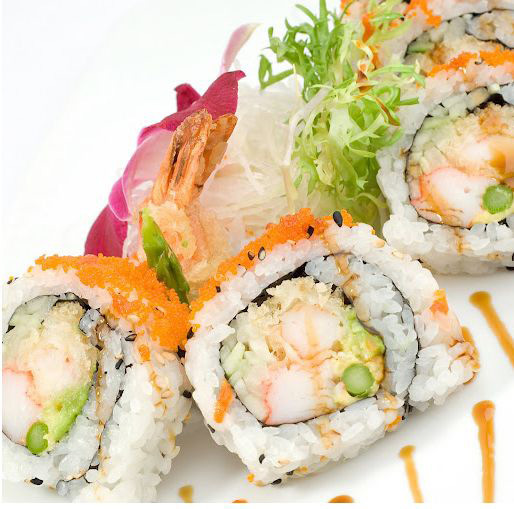 Due to his hands-on research and ridiculous weight gain, the people of Raleigh are provided with the most beautiful, delicious Japanese food and sushi. I had the opportunity to try multiple dishes at Sono and I was highly impressed. As Chef Mike stated, “in Japan food is about seeing first.” I was blown away when Alejandro brought out the tuna tacos for me to try; the food was almost too pretty to eat! 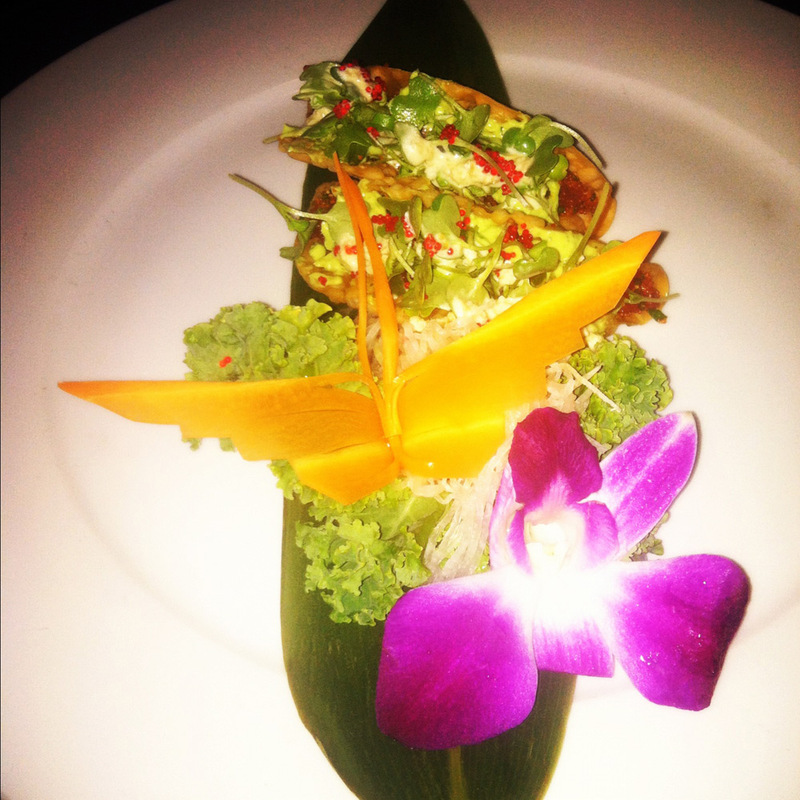 An eye-catching butterfly sculpted from a carrot and a purple orchid garnished the dish. Shichimi spiced tuna poké, avocado mousse, micro wasabi, masago, and jalapeno aioli were served in two crispy wontons. The tuna tacos were dainty and I enjoyed the crunchy wonton shell, spicy flavor and fresh fish. Sono imports exotic fish to provide customers with the freshest sashimi possible. You can even join their “fresh fish list” to be in the know about their latest deliveries. I tried the fresh hamachi (yellowtail) from Japan. 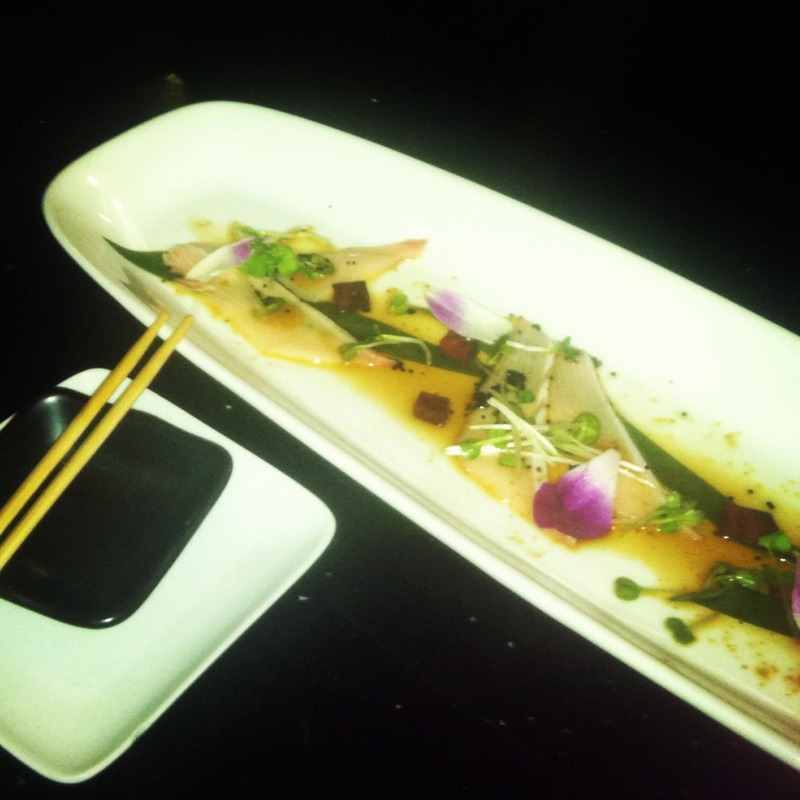 The hamachi was served with serrano peppers, honey miso, shichimi ponzu, kaiware, pickled beets, and tobiko. I enjoyed rolling the serrano peppers and pickled beets inside the piece of yellowtail fish. The honey miso, bite from the vinegar, and peppers created an excellent sweet and spicy flavor. I was also blown away by the freshness of the fish. 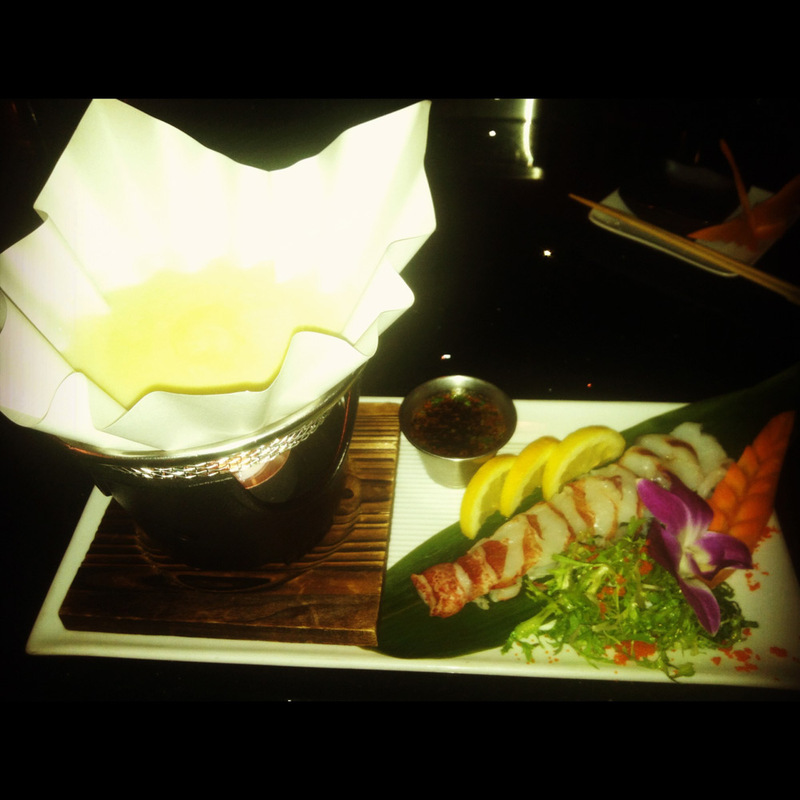 I was overwhelmed when Alejandro brought out the next dish, lobster shabu shabu. He explained that I needed to dip the butter poached lobster inside the kamisuki hot pot. How cool! I was in charge of “cooking” my own food. The lobster was buttery and melted in my mouth. My eyes were then drawn to the other side of the restaurant where an entrée was headed my way and it was glowing! 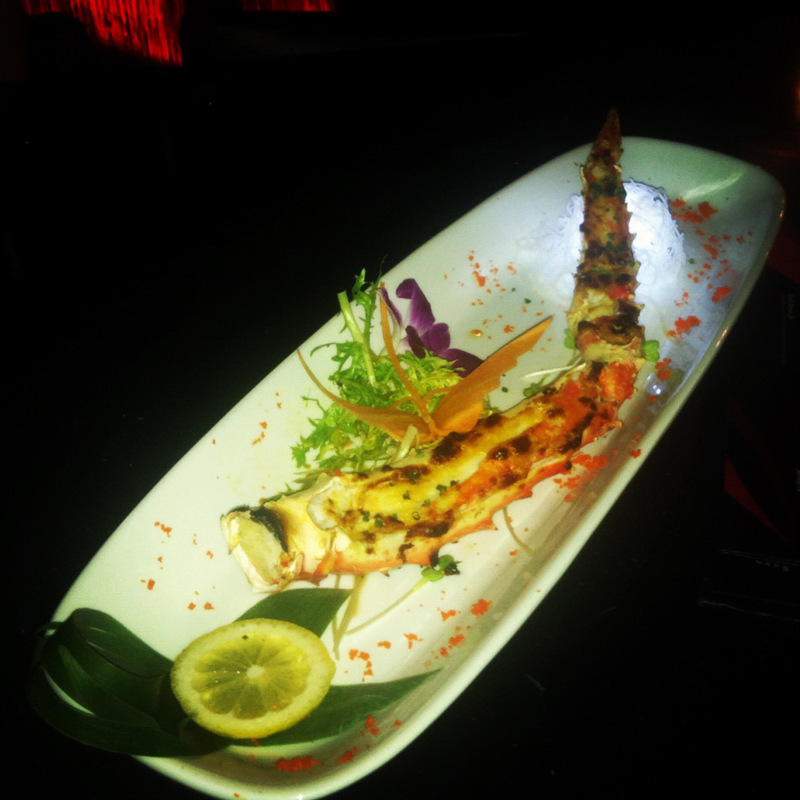 My mouth dropped when Alejandro placed a king crab leg in front of me. The king crab was broiled with shichimi spiced uni butter. The crab meat was tender and tasted divine. Could this night get any better? I’ll answer my own question; the night did get even better. The last dish was my favorite, the broiled mero sea bass. 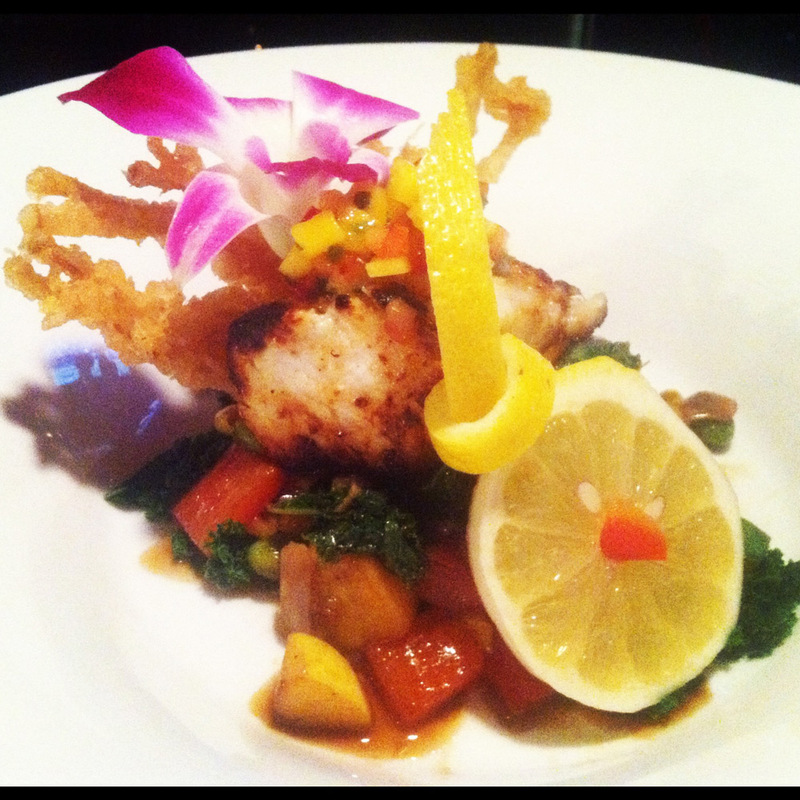 A tender piece of saikyo miso marinade Chilean sea bass was topped with a sweet mango salsa and served on a bed of savory succotash. Thank goodness for to-go boxes, I enjoyed this dish for lunch the next day too. Chef Mike Lee is one of the nicest, most compassionate people I have ever met. He is dedicated to balancing family life with work and beams when talking about his wife, Yeon Ju and adorable son, Jun. Every plate matters at Sono, which can be seen by the intricacies and exquisiteness of each dish. Chef Mike Lee treats everyone like family and welcomes you to experience the fresh, delicious food at Sono. 5. My worst kitchen disaster: An employee dropped a lighter for the grill inside the deep fryer. The lighter busted inside the hot oil causing burns on some employees. Chef Mike Lee’s family (from left to right): Jun, Yeon Ju and Mike. Written by local Foodie Kristen.